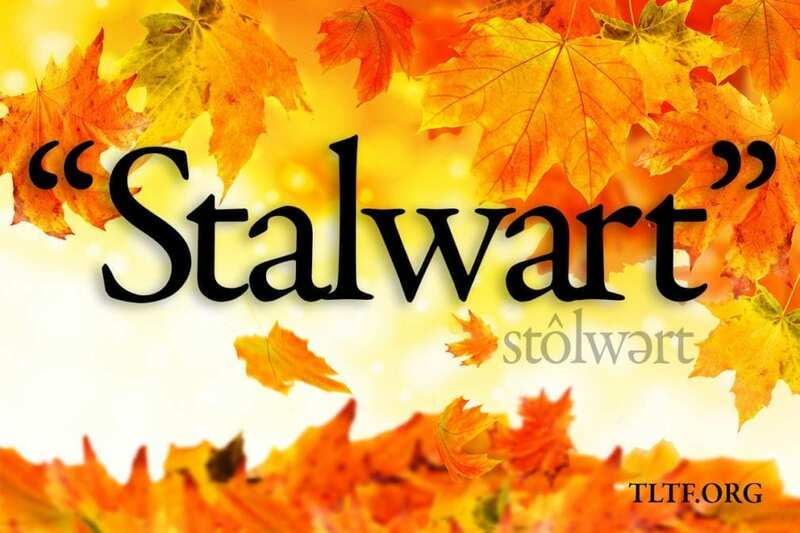 That appellation sounds good, but what exactly does “stalwart” mean? Good question. “Strongly built; sturdy and robust; strong and brave; valiant; firm, steadfast, uncompromising.” Plenty of verses in God’s wonderful Word support those definitions as to who He has made you to be as His child and a minister in the Body of Christ. Yeah, I know, now all we gotta do is live up to them. Easier said than done, but certainly attainable, with the Lord’s help. It’s hard to believe, but another calendar year has almost passed. Given that you are reading this, you’re apparently still on the planet. Congrats. I guess the question is, “Are you more spiritually fervent than you were right after you first heard God’s exhilarating truth X years ago? Without going into the context of the following statement, a dear believer once said to me about 20 years ago, “One thing you can do for me is to keep going.” How can you and I do that, day after day, year after year, while increasing our commitment to so doing? I hope you will find some keys in this letter. So here I am, turning 75 this month (and celebrating the 47th anniversary of my ordination), with a number of dings, dents, chips, and scratches (kind of like our used RV), with my healing still being consummated, and hoping to pack up a 70-year-old wife, dog, and cat and embark on an adventure so ambitious that it almost frightens me. The operative word there is “almost,” because for 53 years our Heavenly Father has showered me with grace and mercy and provision that are light years beyond what I deserve. Thus far He has amazingly put the pieces together for us to take this next step, and I guess He won’t stop now. If He does stop, whoever wants our RV can come to whatever Interstate rest area at which we have expired and take home the bus. Speaking of which, RV there yet? 19I remember my affliction and my wandering, the bitterness and the gall. 20I well remember them, and my soul is downcast within me.21Yet this I call to mind and therefore I have hope: 22Because of Yahweh’s great lovewe are not consumed,for his compassions never fail. 23They are new every morning; great is your faithfulness.24I say to myself, “Yahweh is my portion; therefore I will wait for him.” 25Yahweh is good to those whose hope is in him, to the one who seeks him. Here in the USA, we celebrate our national Thanksgiving holiday this month. But for every Christian, THANKSGIVING should be part of each day’s celebration of life—for many reasons. First and foremost, God says to be thankful (Ps. 100:4; Eph. 5:20; Col.3:15). One reason is because Thankfulness almost automatically dispels fear, impatience, anger, worry as it orients your heart to our Father, who is all good all the time. Often during the course of my comparatively “cush” life, I’ve interrupted a “woe is me” lament and quoted my favorite Veggietales line, “What are you, nuts? !” Then I realize that this is nothing compared to what the apostle Paul, et al, endured. And he never had an air-conditioned vehicle, an iPhone, a computer, Internet access, a refrigerator, washer and dryer, or the NBA Playoffs. Prayerfully consider his poignant words as he honestly and vulnerably lays out his heart for the believers of all time as an example, and a goal, of perseverance in the face of monumental spiritual adversity. The prefix “per” means “through,” and what we go through are “severe” situations. I’ll explain my red ink insertions afterward. 23I have worked much harder, never been in prison more frequently, never been flogged more severely, and never been exposed to death again and again. 24Five times Never have I received from the Jews the forty lashes minus one. 25Three times Never have I was beaten with rods, once I was never was I pelted with stones, three times I was never was I shipwrecked, I never spent a night and a day in the open sea, 26Sometimes I have been constantly on the move. I have never been in danger from rivers, in danger from bandits, in danger from my fellow Jews, in danger from Gentiles; in danger in the city, in danger in the country, in danger at sea; and sometimes in danger from false believers. 27I have labored and toiled and have often at times gone without sleep; I have known hunger and thirst and have often gone without food between breakfast and lunch; I have been cold while skiing and naked.28Besides everything else, I face daily the pressure of my concern for all the churches. 29Who is weak, and I do not feel weak? Who is led into sin, and I do not inwardly burn? 30If I must boast, I will boast of the things that show my weakness. 31The God and Father of the Lord Jesus, who is to be praised forever, knows that I am not lying. 32In Damascus the governor under King Aretas had the city of the Damascenes guarded in order to arrest me. 33But I was never lowered in a basket from a window in the wall and slipped through his hands. First of all, if Paul is a “basket case,” that’s what I want to be. Second, I trust you noted my inserts in describing my own ministry. As I heard a preacher say recently, I want to tear down the firewall of emotional detachment and launch out from the safe harbor of theory into the tempest of reality. As Esther said, “Is there not a cause? If I perish, I perish.” So be it. Sad to say, way too many wonderful Christian friends I love have grown “tired of the fight,” in particular doctrinal squabbles and infighting among believers, and who thus have sat down on the sidelines. The Word of God makes it crystal clear that such challenges go with the territory, so we should not be surprised, though it is easy to become discouraged by external opposition and internal contention, just as it is in an earthly family. It is frustrating that one of the most, if not the most, mangled Bible verses is Romans 8:28, which in nearly all versions says, “All things work together for good…” In light of the unspeakable horrors throughout the checkered history of mankind, a modicum of concentrated, logical thought would immediately reveal that rendering to be completely illicit. Thank God someone on the NIV translation team rendered it, “IN all things God works for the good of those who love Him.” Right on! But I just heard a radio teacher say that God ran over a guy with a big truck and crushed his pelvis in order to bring him back into the fold. Jeez, the truck folded the guy. And if it is true that God “calls people home,” just DON’T ANSWER! Legal question: What do we call it when one person determines the time of another’s death? Right, murder. 10God is not unjust; he will not forget your work and the love you have shown him as you have helped his people and continue to help them. 11We want each of you to show this same diligence to the very end, so that what you hope for may be fully realized. 12We do not want you to become lazy, but to imitate those who through faith and patience inherit what has been promised. One way we show our love for God is to love people, and that reminds me of Matthew 25:40: “Assuredly, I say to you, inasmuch as you did it to oneoftheleastofthese my brethren, you did it to Me.” Or not.